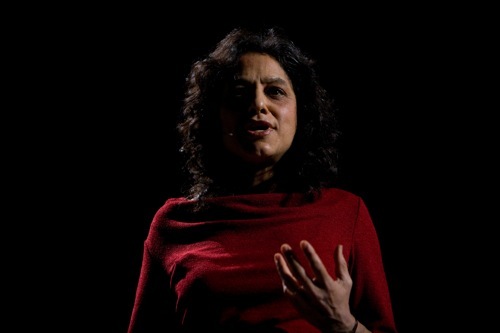 If you’re in the Montreal area this coming March, prepare yourself to be wowed by Professor Nalini M. Nadkarni. An inspiring multi-disciplinary scholar and TED sensation, Nadkarni is a professor at Evergreen State College in Olympia, Washington, is known for using nontraditional pathways to raise awareness of nature’s importance, working with artists, dancers, musicians, and even loggers. For three decades, she has climbed trees on four continents, using mountain-climbing techniques, construction cranes, walkways, and hot air balloons to explore the world of animals and plants that live in the treetops. In 1994 she realized that there was no central database for storing and analyzing the research she was gathering, so she invented one. This state-of-the-art repository, called the Big Canopy Database, is credited with speeding cross-disciplinary collaboration just as a common database revolutionized the mapping of the human genome. Her most recent project, funded by the Washington State Department of Corrections, engages scientists and prisoners in collaboration to carry out research projects in conservation and restoration biology. Inmates have raised endangered frogs, prairie plants, and butterflies, which are then released from captivity to the wild, giving prisoners rare access to nature, as well as a sense of accomplishment and connection to doing something good. In recognition of this work and more, she was a recipient of the National Science Board’s “Public Service Award” this year, which honors an individual that has made substantial contributions in increasing public understanding of science in the United States. This is bound to be an impressive lecture, so please watch this space in the coming months for more information!